The Bainbridge Island Japanese American Exclusion Memorial Association (BIJAEMA) is a nonprofit 501(c)(3) organization that created the memorial. Donations support the maintenance and operation of the memorial and grounds. BIJAEMA relies on volunteers and the generous support of all those who are moved by the story that the memorial wall honors. Please consider donating to this ongoing project. 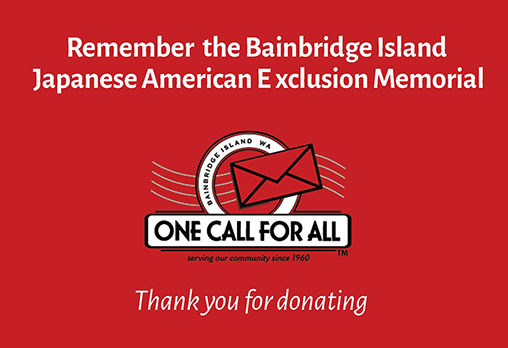 This time of year, please make your tax-deductible donation to the Memorial by using Bainbridge Island's One Call For All program, here.